EcoFlame Mission: Promote the use of safer, non-flammable fuels. Our business has been formed to introduce the next generation of firepots, firepits, firebowls, desktop fireplaces and other decorative fire devices that only use non-flammable fuels. EcoFlame believes that for fires in-and-around the home, non-flammable fuels are the future. It’s the smart decision. Non-flammable fuel….is that an oxymoron? No. Most people are a little confused when they hear ‘non-flammable fuels’. Consider a log; it is non-flammable, but yet it’s combustible. The same is true of our non-flammable fuels. There is no danger of the fuel bursting into flames because at room temperature, there are no gases being released into the air. With a 200º F flash point, it’s no more dangerous that the vegetable cooking oil in your pantry. Pour fuel into a cup or spill onto a table and it is impossible to ignite with a lighter or match. The fuel requires a wick in order to burn, and even then, lighting the fire is a slow process. Why are non-flammable fuels safer than flammable fuels? Even the most safety conscious people can make mistakes when working with fire. Whether it’s a lack of focus, being silly for a moment, or just not knowing how dangerous flammable fuels can be…mistakes happen. One of the most frequent mistakes made is when refilling; and fuel is poured onto an open fire. With a fuel like ethanol, that could be explosive and dangerous. With a non-flammable fuel, just the opposite; the coolness of the fuel will actually extinguish the fire. And, it’s safe to store around the house. EcoFlame offers two distinct types of non-flammable fuels, each with their own advantages. 1. 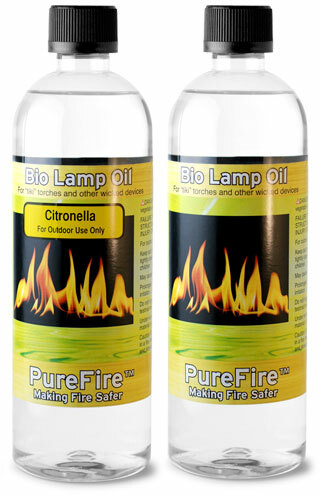 PUREFIRE™ bio-lamp-oil is intended for outdoor use, it is available in both a standard and citronella version. This fuel ‘wicks’ extremely fast and is relatively easy to light. It burns with a flame that is brighter than ethanol and more visible during the daytime. PUREFIRE™ is an extremely long burning fuel. A small 150 ml canister in firepot will burn for up to 4.5 hours. (depending upon the size of flame you choose). The last generation of pourable gel firepots typically held 290 ml of fuel and only burned for about 1.5 to 1.75 hours. Current canned ethanol gels are no better and generally, the flames become small (almost not visible) at the end of the burn. Being a wicked device, PUREFIRE™ firepots have a full height bright flame down to the end of the burn. PUREFIRE™ is the most economical fuel you can buy…it has the lowest operating cost per hour of any liquid or canned fuel. PUREFIRE™ releases a very small amount of soot, about 1/1000th of the amount produced by a the most popular Tiki Torch Fuel. For that reason, we recommend PUREFIRE™ primarily for outdoor use, but it can also be used indoors. It is ideal for all types of patio and garden torches and our new generation of EcoFlame FirePots™. 2. 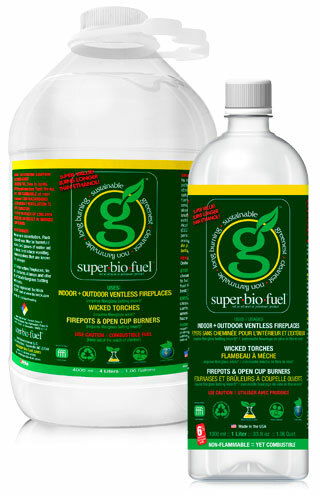 SUPER.BIO.FUEL™ is a superb indoor or outdoor fuel. It is the only fuel we offer for indoor use; and fireplaces and firepots must be fitted with a special high quality fiberglass batting in order to burn the fuel. Virtually smokeless, sootless and odor free (until the fire goes out), the main exhaust fumes are small amounts of water vapor and carbon dioxide. Each of the fire devices we offer on our site are fitted to burn one or the other of these two fuels. Each device should only be used with the fuel it was designed to burn. Each item states clearly the type of fuel to be used. Over the next few years, EcoFlame will continue to pioneer the implementation of non-flammable fuels in an every growing number of decorative fire devices.